Basic Attention Token (BAT) continues to create new highs and outperform the rest of the market. And there is some important near term resistance that looks to be broken very soon. The entire cryptocurrency market continues to show bullish activity and continued accumulation. A great majority of cryptocurrencies that have active (and honest) volume continue to perform well. And perhaps no other cryptocurrency has been showing such bullish activity, both fundamentally as well as technically, then Basic Attention Token (BAT). While Basic Attention Token’s average performance against many other successful altcoins may not appear to be different, it is. Fundamentally, Basic Attention Token is up over +20% over the past seven days. Over the past 30 days, it is up over +50%. This is a considerable amount. While that performance is in line with many other cryptocurrencies, it’s the technical chart that shows Basic Attention Tokens strength. While at first glance Basic Attention Token’s chart may not look all that different than other crypto charts, there is one glaring condition: Breach of 6-month highs. What I find so strong about Basic Attention Tokens chart is the strength and conviction behind it. Almost every single cryptocurrency that has experienced a rally since the beginning of the year, even Bitcoin, has seen extremely deep retracements. Basic Attention Token has not. It has even found support against the 2/8th Major Harmonic at 0.27228. And Basic Attention Token has another factor that is supporting this growth: adoption. On April 11th, 2019, one of the largest news agencies and newspapers in the United States – The Los Angelas Times, announced that they are now a verified Brave browser publisher. Not many cryptocurrency projects or networks can claim to have such clout and adoption. As publishers and news agencies continue to struggle to keep their own add revenue, more and more people will come to find BAT the currency for their advertising and customer base. Something of a shared condition on many of the cryptocurrency charts I look at is price being halted against either the 50% or 61.8% Fibonacci arc. Given that markets are fractalized in nature, it makes sense that this particular arc has been a stopping zone for many cryptos. Currently, Basic Attention Token is right up against its 61.8% Fibonacci level. But it is poised to break through that zone. The daily wick and high of the day have already pierced that level and prices continue to creep ever so slightly into that zone. The only real hold up in the short term is the presence of the 1×5 diagonal angle, but that particular stopping point will be moot every beyond today. 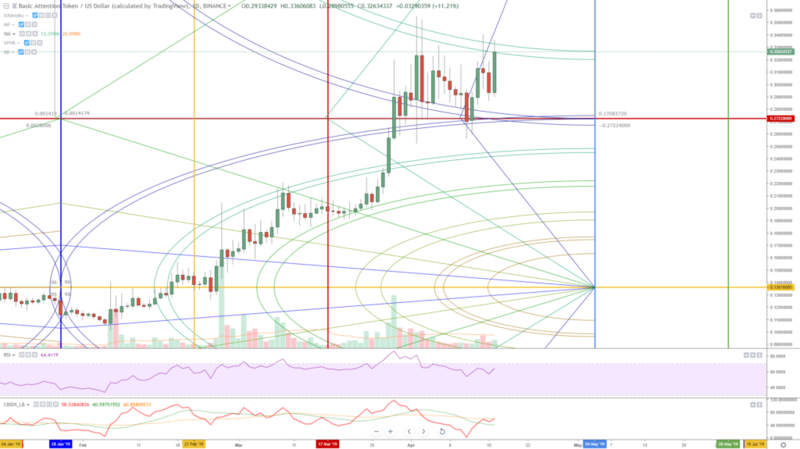 Additionally, a break and (preferably) a close above the arc would give Basic Attention Token an 8-month high close – something very few cryptocurrencies have. If the current aggregate crypto market continues its current pace, Basic Attention Token will easily re-capture 50% of its all-time high. And if Basic Attention Token continues to grab bigger names into their ecosystem, new all-time highs won’t be very far away either.